Cars and Coffee is back for 2019! This is a FREE event! Bring your car, buy some coffee, and help good causes! 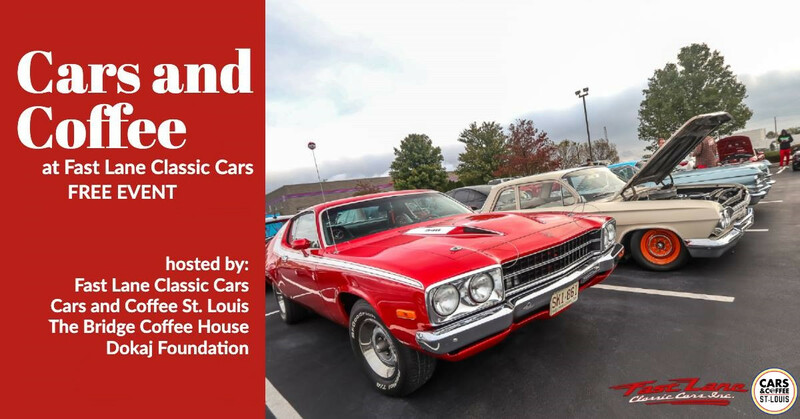 There will be 7 Cars and Coffee events at Fast Lane Classic Cars this season, on the second Saturday of each month from 8AM - 10AM. Everyone is encouraged to bring their cars, trucks, bikes, and other wild rides for everyone to enjoy. Our entire facility will be open, including three huge showrooms with over 200 classic and collector cars, trucks, and motorcycles. At every Cars and Coffee St. Louis event you will enjoy cars, coffee, and meeting like-minded automotive enthusiasts. Cars and Coffee St. Louis events are kid friendly and pet-friendly. We are proud to have The Bridge Coffee House available for coffee sales. The Bridge Coffee House is a community-minded coffee house that sells and promotes fair trade goods which provide hope and justice for people in developing countries. We will also be joined by Dokaj Foundation at all our 2019 events. The Dokaj Foundation is a non-profit organization meant to drive charity and create miracles for hopeful children in need. They work closely with area hospitals to deliver toys dressed as superheroes to seriously ill children.